So crisp I can almost feel the cool breeze and sunlight's kiss... Awesome work Mr. Bliss! This image is quite lovely. Having it on my desktop is like being able to visit a little haven whenever I wish, in the midst of a long session of online tasks. Thank you for sharing your artistry. "Reminds me of a George R.R. Martin story"
Having just finished reading George R.R. Martin's short story, "With Morning Comes Mistfall," I was delighted to see this image. It reminds me of the setting of the story -- a hotel on a planet where the mist falls in the morning to the valley and rises in the evening to once again obscure the other mountains. I visited China a few years back, and took a cruise up the river. The views I saw there were phenominal, and this looks very much like one of the actual photos I took. And Yes! I DID indeed see the blue sky and fog at the same time. Thank you for the wonderful image! I guess fog really is low hanging clouds.. but just how low depends on your position. I particularly liked this version of it.. showing sky clouds and bits of sky, even tho in my experience one can not see sky that is blue at the same time there is fog on the ground. I like this picture so I will assume you see something like this from your vantage point on that mountain. Perhaps it's a position that gives one a different perspective than if one is say, at sea level.. especially if one is at sea level in a fog. To quote Homer Simpson. Except here the slant is not a good thing and very distracting. Also, those weird clouds are even more noticeable on the triple screen. on the dual-widescreen one I noticed a stretched slant as well, on the balcony rail you can see the pillars are all stretched and the floor tiles too, I know sometimes we bug you to get us the dual and ti screen versions, and I'm guessing you rush it sometimes, I'd rather it take a month and look good then get it in a week and be nit picking. Ryan, I noticed that on the triple screen version the right side is slanted a bit. Why does it do that? I know it's probably unavoidable because you have talked in the past about not doing a triple screen version of some wallpapers because it would distort the image too much. I don't know much about making digital artwork, and I'm just curious as to why the render looks that way. And it was worth the wait, the dual wide screen is incredible, I have been waiting for you to make this one a dual wide screen, as the wide screen ones are already on my PS3, PSP and Laptop, now its on my desktop too. Whilst people may get more demanding and nit-picky I ultimately think that the more people do point out flaws and give suggestions the better the work is going to get. Of course you can never alter any piece of art forever in this way as that would totally detach the creator from it. I would think that specific criticism or even specific praise is far more helpful that general insults or just random statements of flattery, although there's nothing wrong with that latter. Thanks for this, it's breathtaking! It'll replace my old one for sure as soon as there's a dualscreen version up. And to all the nitpickers, chill out. He's the artist, he'll make things how he likes. How would you like it if random people you've never met criticized your work with such terrible suggestions as, "You should put a lady on the bench." Ugh. is it too much to ask for you to make a duals creen version before you make a night tiem version? "I think it's funny, Ryan, the better your work gets, the more demanding we get." Had you made a pic like this 7-8 years ago, people would have been falling all over themselves to congratulate you and tell you how amazing it was, without ever once pointing out, or even noticing, any "flaws". Sure, I don't always like everything you do, but in my case it's more of a personal preference thing, not a nit-picky thing. I prefer space scenes and abstracts over beach and forest type scenes, but that's just me. I have no knowledge whatsoever of any of the programs you use and what's involved in putting one of your scenes together, but I know what I like. Bottom line is keep on doing what you do, and don't let the nitpickers get you down. Looks great! 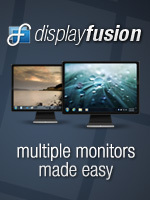 Is a dual monitor version coming down the pike? "looking forward to the first Triple Wide Screen"
Looking forward to the first Triple Wide Screen of either "Island Time" or "Cloud Terrace". I'm voting for "Island Time" personally. As you say, all works of life are open to everyones opinions, and mine just happens to be that both "Island Time" and "Cloud Terrace" are 'nice' but not my personal cup of tea; so I'm /really/ looking forward to your next planetscape or abstract in triple wide screen. Keep doing what you do; which is making frigg'n awesome 3D art! "nice image but improvements needed on balcony"
Nice image, some suggestions.....I am only looking at a realistic point of view...the rails on the balcony are too short, it appears I can just walk out there and lean a little then fall over very easily and die....2.) the bench needs to move back just a little bit for it is too close to the rails, and 3.) how about adding a lady there sitting on the bench? It makes the image more meaningful..
Those are just ideas....other than that nice work! Just my 2cents worth - thanks for all the great art. Before you go making night ones of this could you please do a dual-wide screen of this, I have been waiting for it since you posted this one, I love it, and I want to span across both my screens. This combines the best of some things done in the past--it all comes together in what I would call a tour de force. So nice! I particularly like the detail design pattern in the walkway surface agianst the background of much sofer edges. Have you consdered a dawn and dusk version of this? I anxiously await the dual moniter version. Love this one. It kinda unites plants, earth and the sky. I would like to see a little more of a foresty green in the trees on the mountains. Just a little. Otherwise great work again Ryan!! This one looks especially nice on my Nokia N810 Internet Tablet. It shrinks down nicely and stays sharp, without losing any of the depth and texture. The only suggestion for change i support are the clouds in the upper right of the image; they indeed look a bit like lava. But the sun should definitely be not less brighter. I'm always very attracted by the mood of a low but bright sun like in Cloud Terrace. The terrace is a must. Very important for depth, pls don't change it. Too many mountains? I don't think so. This picture reminds me of pictures of China and Thailand. I like this image the way it is pretty much. Maybe some of the many suggestions are valid such as fixing the clouds in the upper right corner, but I don't see anything complaint-worthy. I said "Ooooh" when I first saw it. It's on my desktop right now and I am happy. I definitely do not mind criticism, as long as it is constructive and well reasoned. Just about everything I have read here seems to fit that description. That's not to say that I agree with all of it, but everyone is entitled to their opinions and they are free to share them here. I welcome the feedback. I have no problem with me occasionally not liking an image but, correct me if I'm wrong, user comments and opinions are usually greeted well. I generally like this image but feel the fern type plants are a bit un-realistic and not in the style of the rest of the image. And as someone else pointed out close up the top left clouds do look like lava from a lava lamp. I do like the mountains and clouds though and think that there's nothing wrong with the number of them and the trees. Oh and a night version would look quite good. "What's with all the complaints?" 1. Complaining about the green is ridiculously nitpicky. 2. The terrace is the *point*. This wouldn't be half the picture it is without it. 3. If you want a picture of less mountains, just get a free one taken in the Himalayas. 4. A night version would be rad. Thanks for the hard work Ryan... fascinating stuff. An evening version would look really good with this one. I really like it. I am a huge fan of all cloud images. I think some are nit picking it a bit too much. I really like it and it has become my new work wall paper. "Reminds me of the Inca Trail"
I notice a few people have commented on the clouds, and I can see their point, but I can imagine they're one of the toughest bits to get right, and they don't really bother me as they're not the main focus. The mist, however, is brilliant. I wonder if it's worth trying to make the foliage more reflective, like leaves of some jungle plants - I thought that might give the trees a beautiful bright outline in the sun. It's just an idle thought, though. Thanks for another fabulous landscape, Ryan! ...must say, I loved the picture and commented on Facebook - but since reading others' views, my attention has been drawn to the "odd looking clouds in the top right". Yes, lava-lampish. No, don't really like them! This is just not doing it for me! It feels bare and dead! The balcony is just in the way of something that can be so beautiful! Wow I love it. Only thing I would want to see in a revision is maybe more of the terrace, just a little, as if you were to take a few steps back on the terrace. Not a problem with the wallpaper, just a personal preference. But really, this is an awesome one! Some have said do a night scene, and i think that would be great. But personally you do a lot of planet scenery. With the view from this angle, and with what little sky you have, a planet or a satellite of some sort would be too big. 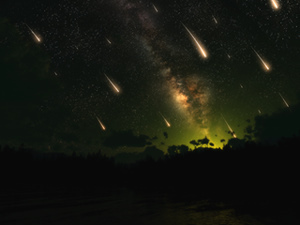 I think something like a milky way across the sky with a shooting star or a meteor shower would be cool. People have said that putting some lighting in like camp fires would be a good touch. Well maybe you should to the opposite and use bright points in the sky to like the place like you do the sun. "I agree with the suggestions"
The image is good in it's current state but it could be great if you followed some of the previous suggestions. Cut down on the brightness in the top left corner. If done with a night sence add a moon? "needs a bit more work"
*make the clouds "rougher", especially on the right. I agree with Mercury, who said they look "lava lamp-ish." "Similar to first version of shrouded desert"
I loved the lighting and the concept. However, I think this looks a lil' too unrealistic. I think I would like to see a pickle jar version with much fewer mountains..and the fern can afford to look a lil' less green. But I reiterate the idea is interesting. Wow! This one has a great concept going on!! Maybe you can add a beautiful clear sky full of stars and a crescent moon, some torches on the terrace and maybe some random lights on the mountains... like small bonfires or glowing crystals...!! Would be great, in my opinion! "Great idea but needs more work"
I absolutely love the idea of a terrace overlooking a grand view below. You've had several in the past of this genre (e.g. MorningGlory2005). But this one just doesn't do anything for me; not sure of why. - The mountains do not look real. - There are far too many of them. - Consider fewer mountains, night scene, city or something illuminating the clouds from below. I agree with 'Tril's' comments on the 'trend' toward much flatter more digital images which have been on throughout this year. -More dynamic lighting. I know others feel this image would work better at night, and I agree, although I do know you like to make day ones first. Even so, even in the day, the lighting could be far more interesting. -Clouds. I like clouds, and you do them really well, but at the moment they are a little bit 'bed-like' and they need to be more 'textured'. I'm not quite sure how you would do that, but I'm sure you'd give it a shot. -Terrace. I'm a bit undecided about the Terrace, I think it's important, but the moment it seems like it's 'hanging' in the middle of the air, and it doesn't feel like it's attached to anything. Also, it looks too 'rendered' for my taste. -Hills. The hills are far too pointy, and they don't look realistic enough. They also need more trees. So yeah, just a few suggestions for you. My account is about to expire in 5 days, and I'm not sure if I'll renew or not just yet, I'll wait and see if there are some more that I like in the future. But having said that, db is my favourite site, and I'm not sure how I'll survive if I can't visit it any more! You are very talented Ryan, and very good at looking after your customers. Oh man, I was going to create an image almost just like this- you beat me to it! You did a better job than I probably ever could, though. I have a minor suggestion- I think the ferns are a little too bright/glowing to be realistic- maybe try turning down the "backlight" control to 50% in the leaf material editor. I've always wondered how you put your stone designs on your objects- I would guess you use Lightwave to do it for those odd-shaped objects. But they always come out perfectly, like here and in White Magic and Astronomer to name a few. Do you use UV mapping to achieve this? Anyway, this is an awesome image- one of my favorites. I especially like the odd mountains and the cloud detail is amazing. Well worth the wait! I did notice that the clouds in the top right are not of the same quality as those slightly to their left. I think the main problem with them is their sharp edges and generally globular shape. The other clouds do look really great though! Anyways I just love this picture. 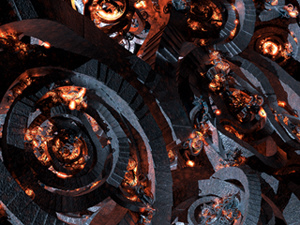 (by the way do you prefer we refer to these as works, pictures, renders?) It's hard to believe but they just keep getting better! I'm afraid I have the same problems with this picture as with most of your recent works...it seems flat and unrealistic. I look at it and my brain immediately thinks "render" instead of getting swept away in the scenery. The clouds in the upper right are particularly unconvincing. Since in the past you've produced some of the best rendered clouds I've ever seen ("Tropic of Capricorn 2006", "Circumpolar"), I find that hard to understand. I've loved your work for years and it's clear you have tremendous talent, so I don't know if it's a software issue, or what. The lake in the original "Song of the Sky" back in 2000 had a level of both beauty and realism that water surfaces in recent works like "Island Time" and "Lone Tree" don't even approach. What happened to texture? The one thing I do like in this picture is the terrace in the foreground. I tend to like all of your stuff; but you tend to go way too bright on them, maybe that is just me. I always like to see darker or night time version for them, I mean in these formats you can see a great amount of detail, but on a bright monitor the bright colors can hurt the eyes. Ryan, the background of this wallpaper is breathtaking... maybe one of the most spectacular things you've done yet, but there are a couple things that I think could probably be changed around a little. First, the clouds on the right don't seem consistent with all the others in the picture. It doesn't really bug me that much b/c it's such a small area, but at the same time, that exact reasoning leads me to believe it would be a quick fix. More importantly though, I wish you would have paid a little more attention to the repeating foreground textures. Individually the textures look very detailed, but together, especially on the banister, that detail is totally lost. I find myself looking at the repeating squares, not the fine stone texture around them. But once again, these don't ruin the piece for me. This might be my favorite of your works as of right now. P.S. - It might be a cool idea to see if you could pull off some condensation on that stone. Anything to make it as visually interesting as the background. It's just occurring to me now that this is the biggest problem with Cloud Terrace. You made way, way too good of a backdrop! "Is it just me or do there seem to be more negative comments these days...?" So far the only criticism I agree with is that of kremer, who mentioned the clouds in the upper right hand corner. . they do kind of look lava lamp-ish. Other than that, though, I think this is a fantastic image and a great concept. I don't think it's too bright at all, as some have said. I'm looking forward to any updated versions, as you mentioned that you may not be done with this one yet. "What Liz, Michelle and others have said"
i'd love to see a night version too! and sunset version! I really like this one! I think the scene is incredible, but some of the clouds in the top right corner look solid rather than wispy like the rest. I think this is the best of 2008. Would like to see this as a night scene in the picklejar some time in the near future. 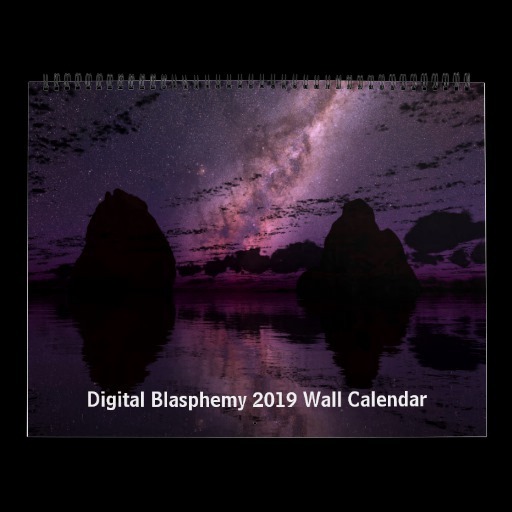 Great work, Digital Blasphemy is my exclusive desktop wallpaper provider! I love this wallpaper, and I can't help but agree with Spectrum. I have always thought some of your wallpapers would look even better if we had an idea of what the surroundings looked like. A series of wallpapers on this same location but from different perspectives would be cool. Like Spectrum said, maybe one from the valley looking back at the balcony. One from overhead as a bird would see it looking down on the structure and the surrounding mountains. I remember really liking the "Hall of Beginnings" pictures on Savinoff.com (you link to it on your free site) and it was really cool how there were multiple pictures of the same tower but from different angles and perspectives. Something like that would be really awesome here. Also, I agree with everyone else about the night/evening version (especially the LotR idea!). the last two images have just seemed off. Not as refined as most of your work. On this one, the background is awesome but the balcony seems tacked on by a different artist that's not quite up to your level. And I type this hoping you'll understand I think your work is 98% awesome. That's why I happily pay for this site. Thanks for your work and understanding. 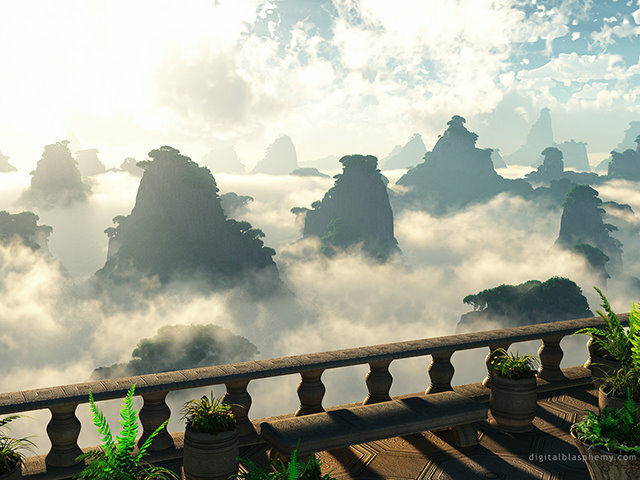 One more crazy thought, in one of your future artworks maybe you could create a scene where you are down near the bottom of the mountains looking up at the balcony. I am curious what kind of structure you would create to go with the balcony. I like this one, it's very relaxing. Keep up the good work!!! forgot to add this to the bottom of the last one but it would be great to get some time variations on this one like maybe a sunset scene (little brother asked me to add this cause he likes the sunset scenes). This has to be the greatest yet! love the variation of the scenery to expose the tranquility of the mountain top villages and homes. Well done. I do agree with many of the comments in as much as where there is day there is night. I love that you turn many of your day shots to night so looking forward to a night version of this shot. As always keep up the great work! I really like it, but I think a night version will be even better. I hope you're planning one, Ryan! I dont think the lighting is over the top or too bright or anything. I think of it like when you are snowboarding, the sun makes the white brighter, not just the snow but the clouds too. That aside, this reminds me of a real life World of Warcraft....thats how nerdy I am. Overall I love it, not as summery as the last one, but that ok its only May. To be honest I'm not a fan of the style of the green bits in recent images, the backroundy bits continue to look spectacular but personally the last two just don't suit me. I'm also wondering if the the current one may look better without the balcony as well. Perhaps it's a new vegetation style because of a change in software or render technique. I'm sorry for the criticism but I say what I see, and if perhaps there are a few other members who agree maybe the next image could be green-free. If it's not too much trouble perhaps you could render an image without the plants and/or balcony. I suppose I can't like all your images and it's not often I don't. perhaps a night version with beacons (think LotR) on each hill? I dont like the terrace very much, but the clouds are great. this is gorgeous, just what i needed to see after a very long day. I don't know, this one just doesn't seem to do it for me. It just seems a to bright. The sky and clouds would probably look better in a sunrise/sunset type lighting, but the terrace looks good the way it is. Overall not something I think I will be using too much. I love it as do most of the others, but as some have said some things might be nice to change a little��just as you said you might not be finished. A wood Terrace could be nice, i'm not sure how browns work in your programs so something more teak colored would be nice. And as some have said i think, at least where the sun is it may be a little bright. But alas i'll need to think it over a little more. Also to bring up another minor thing, i do like the concept of tree topping the mountains but some i think you did too much. You fit so many on some that it looks too cluttered or they are just a little too big in the background. I dont know really but they kind of distract me a little. But as most were saying a night time scene would be cool. But clouds at night� may have to change the title for that one. Other wise i LOVE IT! This might be one of my favorites for 2008. Excellent job! The detail on this one is amazing. I'm not talking about the trees or the clouds, though those are good too; it's the bench and the railing. The engraved designs just blow me away. 10/10! An absolutely beautiful job! I have been on top of a mountain, and the sun is definitely NOT too bright for being way up in the clouds like that. A night render might be fun, but this one is absolutely stunning already! I appreciate the attention to detail you give in all your work. The details in all the trees and plants, and even on the base of the guardrail in this work give a sense of realism that is unparalleled anywhere on the internet. Thank you for sharing your talents with us! Great work, I don't think it's too bright. It keeps me awake, actually, and makes me want to go outside and be productive. I agree that the one fern looks like it's plastic...since all of the other ferns are a mixture of yellow, brown, and green instead of a lime green. Other than that, it's breathtaking! I would also agree that its a little bright. To me, the top leaves on the 2nd-from-the-left fern look a bit "plastic"; probably just that particular shade of lime green. Can't wait for the multiple monitor version. I don't comment very often, but this is really beautiful. It really makes we want to relax and remember that life is too short. This sunlight IS a bit bright. Slightly milder would be okay. However, the scenery is quite relaxing and inspiring. I give it a "9". A night version would be intriguing. The idea of a fire here and there on random mountain tops would be fun to play with. This REALLY makes me want to get away from it all--take a vacation; see the world. I agree with Josh. While this looks amazing already, I can imagine a night/evening version looking just as spectacular. Just thinking about the composition, and probably over-analyzing. Had you considered doing the foreground in wood? I think all that stone and 'concrete' might have been a bit heavy to get up there. And all the other peaks are tree-covered. I really love the rest of the piece though, the clouds are intense! I look forward to a triple screen render, as always. Gorgeous as usual, but for every day, there must be a night and vice versa! This wallpaper and the last one would look amazing with some night lighting or some kind of torches or something aglow. My only complaint is the sunlight (sun) seams a bit over the top otherwise it's picture perfect. I can't wait to see the dual version!